Claire Quinn evades defenders. The sophomore defender scored the go-ahead goal in the Wildcats’ win over Duke on Saturday. Claire Quinn was fouled twice — hard — in the midfield. Seconds later, after bouncing up and running half the length of the field, she was scoring Northwestern’s go-ahead goal. Quinn’s goal with 11 minutes left, the second in a stretch of five consecutive for the No. 16 Wildcats, gave the hosts the lead for good en route to a 12-10 win over No. 20 Duke on Saturday afternoon. 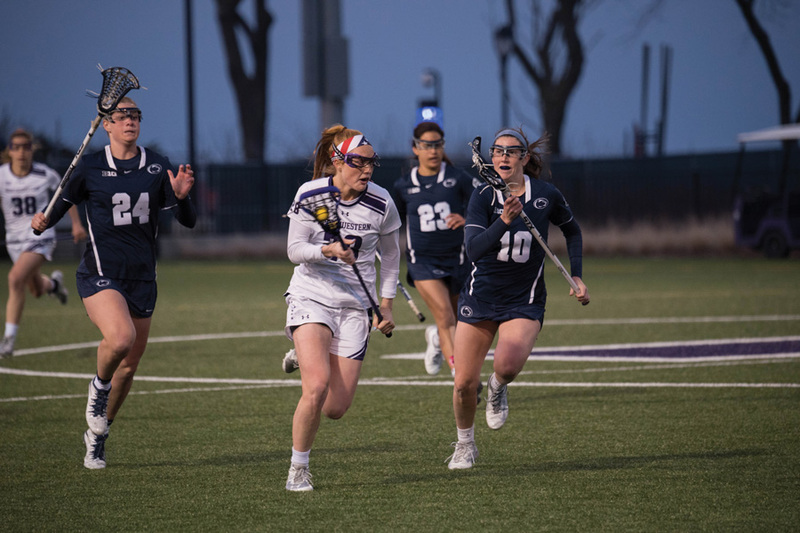 Senior attacker Danita Stroup, on her Senior Day, scored three goals for NU (8-7, 3-1 Big Ten) including the tying goal two minutes prior to Quinn’s go-ahead marker. The win moved the Cats back above .500 by topping the Blue Devils (7-7) in front of a lively crowd of 1,323 at Martin Stadium. NU blew an early 2-0 edge, a 6-5 halftime lead and a 7-6 advantage early in the second half as Duke rallied back to retake the lead on each occasion. But after Stroup buried a point-blank shot off a brilliant feed from junior attacker Shelby Fredericks to tie the score at 8-8 with 13:15 to play, Quinn’s singlehanded effort jumpstarted a stretch in which the Cats scored three times in less than two minutes to open up an 11-8 lead, which they maintained comfortably to the final whistle. The second-half turnaround correlated with an improvement in the circle — Fredericks and her teammates controlled just 5-of-12 draws in the first half but 9-of-14 in the second half — and also a steady lakeshore wind, which blew northward in the Cats’ favor after halftime. Sophomore goaltender Mallory Weisse’s in-game turnaround also played a large role. After allowing Duke to score on five of its first six shot attempts, Weisse made an impressive stop late in the first half for her first save of the game and went on to make four more after the break. Senior attacker and leading scorer Christina Esposito was tightly guarded by Duke all day long and, for the first time this season, did not score in the game. Nevertheless, the offensive slack was picked up by Stroup as well as Fredericks and sophomore attacker Liza Elder, who has now scored multiple goals in three straight games. The win keeps NU in safe position in regard to the NCAA Tournament, which requires teams to have a .500 record or better to qualify. The Cats need two more wins to guarantee that they meet that benchmark, and have two more regular season games and the Big Ten Tournament to do so.